Are you currently looking for a new software for your company? Are you trying to digitize a business process, or to replace a legacy solution? 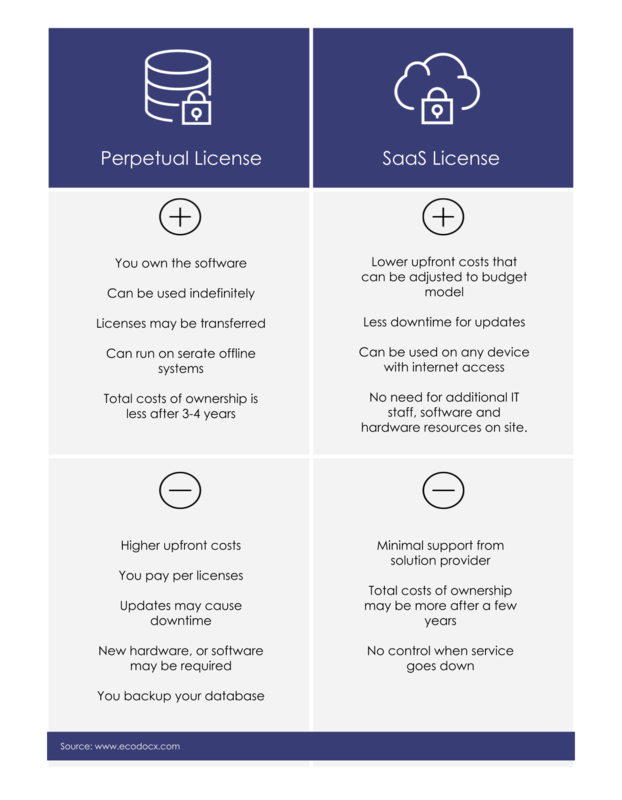 Are you trying to choose between a SaaS or Perpetual license solution, and would like to know which option fits your needs best? If so, you might want to take a quick look at this article, as choosing the right software type is an important element of your IT strategy. Choosing between the two depends on a lot of factors and there isn’t any magical formula that works for all kinds of businesses. SaaS or Software as a Service License is a “subscription” based software service. Let’s say that one day you search the web to find an answer to some problem. After a search, you come across a magazine that has content that you find interesting and helpful. You decide to subscribe to that magazine as it will provide periodic and useful information that will help you address your problems. The SaaS is just like the magazine subscription. So you need a software that will help your team solve problems and increase productivity. A quick online reach reviles a software that fits perfectly to what you were looking for. Most companies offer a free trial version of their software for you to try out to make sure that it is exactly what you were hoping for. After the trial period is over, you get a chance to subscribe to a monthly, quarterly, or annually service. Once you subscribe, you will receive all the latest updates and versions of the software. With SaaS, you as the customer do not have to build up any expensive IT infrastructure like servers, data centers or admin staff. The software is delivered online via a browser and it is hosted by the vendor. So you not only pay the subscription for the software, but also for the necessary infrastructure, maintenance, support, and new versions of the software. In other words, SaaS replaces the capital outlay of buying software licenses and subscription payments make software more affordable. Perpetual License is a “Paid in Full” based software. Imagine you don’t like to wait and have a full control over something, like watching a TV Show. Instead of waiting each week to watch one short episode of your new favorite TV Show, you go to the store and purchase the entire season so that you can watch it whenever and however you want. Unfortunately, once another season comes out, you need to go to the store and buy the new season. The same goes for Perpetual Software. If you don’t like to make payments and you have all the means to pay the full price of the software, you have an option to do it. Buying the software gives you what you need with some periodic updates. Unlike the SaaS, with Perpetual License you as the customer pay for the software upfront with knowledge of limited support and updates time period. You ultimately absorb all the costs associated with the IT infrastructure, maintenance, and admin staff. On top of the license fee, you have the option to pay for one-off implementation services and support contract, which is renewed annually. Based on these two scenarios, which one do you think is a better option? Let’s dig a bit deeper into Pros and Cons associated with each license type. Companies often choose SaaS solutions because of the budget situation in their company. A large point in favor of this type of contract from the customer perspective often is to avoid lengthy capital expenditure approval processes. As mentioned above, for the SaaS the payments are made on a monthly base and are typically recurring and service is dependent on payment of the subscription period. For the Perpetual, the payment is made as one-time up-front payment and may require the approval from the companies management. With the up-front cost, you as the customer are not at the mercy of a subscription service provider and can use the software indefinitely. For most SaaS, the customers will receive some type of client-configuration to ensure that the service runs/connects to their existing system. However, if the customer requires some type of unique customization, such service comes at a steep price. Perpetual license software requires a totally different set-up at the customer, involving expensive hardware, data center resources (facility and electricity), in-house IT stuff for the infrastructure, often resilience measures and almost always substantial implementation cost (either internally or with system integrators). With SaaS, upgrades and support typically are part of the subscription fee. In most cases, the customer will not have any downtime during updates and support is offered 24 hours a day. As far as Perpetual software, the license comes with limited warranty and support. Depending on the license, the customer may have 90 days to a year support with updates or until a newer version of the software is released. Since customer’s sensitive information is stored and hosted on the service providers systems, the service provider is obligated to provide contractual protection. Such protections include security warranties, audits, 3rd party certifications, data breach notifications, and last but not least cyber-attack insurance. Since Perpetual license software is hosted by the customer, the customer will presume control over the security of their data. In some cases, the specific software has to run on a separate server that can’t have internet access according to companies security policies. In these cases, a perpetual licensing model is the only choice. Over time, the Perpetual license software may become a “legacy” software and will no longer be up to date and open to the latest cyber threats. In such cases, the customer will have no choice but to upgrade to the latest version of the software. When a customer subscribes to SaaS, it needs to consider up front how the information will be transitioned off-site. One thing to consider when purchasing SaaS is to ensure that you as the customer will receive periodic data backups exported into a usable form or other formats. Since no software will be used forever, with Perpetually licensed software the data migration and transition will depend on where the data is stored and if the customer has access to source code. Some vendors will provide assistance with migration and transition however if that process isn’t simple, the vendor may offer another service agreement to fully complete the project. So, if you are debating on which one is better or worse, there is really no wrong answer here. You as the company have the means to answer that question and decide what is best for your company. Before making any decisions, here a few questions that might help. Do you want to own the licenses or not? Do you have the cash flow to buy the licenses? Do you have the IT infrastructure to host the new software? How important are the updates and new releases to your company? And if you still have questions, you can always contact Ecodocx for a free consultation. We’ll be more than happy to help.